3. Now Sign up or Login to Your Account. 4. Proceed to the main Page Add Required Medicines or OTC Products to cart and proceed to Checkout Page. 9. The maximum Cashback in this Offer is Rs.300 and if you previously used the offer then you also eligible. NETMEDS 100% Cashback Offer: Hello Looters. I Hope You are enjoying our Best Loot Offers & Paytm Load Money Offers Exclusively Available on Bigtricks App if not Visit Cashbig Now. 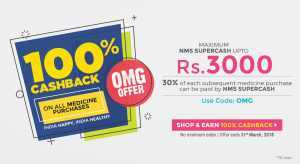 Netmeds is Offering 100% Supercash for Next Order of Medicines with No Minimum Purchase & Up to Rs.3000 cashback.If You want to Order Medicines or OTC Products Then Guys this is A Loot. You Will Get 100% Cashback on All Prescribed Medicines,The Cashback will be Added to Your Wallet instantly and You Can Use The Cashback for Next Orders on netmeds.You can use 30% of the Wallet cash on an order. 1.Download Netmeds App from Playstore. 3.Now Sign up or Login to Your Account. 4.Proceed to the main Page Add Required Medicines to cart and proceed to Checkout Page. 5.Enter Coupon Code: OMG and Proceed to Checkout. 6.You will See 100% Cashback Message. 7.Now Pay the Amount Using Suitable Method and Complete The Order. 8.Once Your Order is Placed You Will Get Cashback with in 24 Hours. What is 100% NMS SuperCash (or 100% Cashback)? We pay you back your prescription order amount (max. Rs. 3000) as “100% NMS SuperCash” (or 100% Cashback), which will be credited to your Netmeds SuperCash wallet. How It Works: After your pre-paid order, placed using the coupon code OMG (between 5th and 31st March 2018), is delivered, the price you paid for Prescription Medicines only (max. Rs. 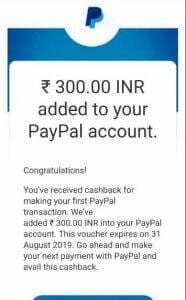 3000) will be credited back in to your Netmeds cashback wallet namely NMS SuperCash. Please Note: The NMS SuperCash wallet amount can be redeemed in your future purchases within 100 days from the date of credit. You can redeem your NMS SuperCash for ONLY a maximum of 30% of total value of prescription medicines in your cart in one transaction. However, you can use the remaining wallet amount in your subsequent medicine orders placed within the validity period of your NMS SuperCash wallet amount. For other details, please read the terms and conditions below. Subject to the following Terms and Conditions, you (or “customer”) will be eligible to receive a 100% NMS SuperCash when you order prescription medicines on Netmeds.com. The 100% NMS Cashback offer is valid from 5th to 31st March 2018. This offer has NO minimum order value. This offer applies ONLY on orders placed using the promotional cashback coupon code: OMG. The 100% NMS Cashback coupon code can be used only TWICE per customer, on separate orders. The maximum cashback amount is capped at Rs. 3000 PER ORDER where 100% NMS Cashback coupon code is applied. The 100% NMS cashback will not be offered for “Shipping Charges” paid for the orders placed during this offer period. The 100% NMS SuperCash will be credited in to your Netmeds SuperCash Wallet account ONLY after your order, (placed using the above cashback coupon code), is delivered. The 100% NMS Cashback offer is valid on fully Pre-paid orders only (not valid if partly paid by COD). COD orders are not eligible for this offer. Also, this offer will NOT be applicable for an order that has been placed directly via “Upload Prescription” option (where only prescription alone is uploaded while placing an order, without adding desired products to your cart and proceeding to checkout). The 100% NMS Cashback is eligible for the orders pre-paid through any of the following payment modes: (i) credit/debit card (ii) Net Banking (iii) e-voucher code/coupon code alone or combined with any of the aforesaid payment method. When NMS Cash in the existing Netmeds wallet has been used to pay for the order where 100% NMS cashback coupon code is applied, Cashback will NOT be offered for the portion of the NMS Cash payment used in the order. If the order has both prescription medicines and non-prescription products, then the cashback offer will be applicable ONLY for the total value of prescription medicines. This offer is non-negotiable and non-binding. The 100% NMS Cashback Offer will become null and void in the event that an order placed using the NMS cashback coupon code is cancelled. How to redeem 100% NMS SuperCash? Just follow these 3 easy steps to redeem your NMS SuperCash, after it has been credited to your Netmeds SuperCash wallet account. Step 1: Add the products you want to your cart. Step 2: At Checkout, Upload Prescription. Step 3: At Review page, under ‘E-Wallet’ payment option, in the “NMS SuperCash” segment, check ‘Redeem’ box and then click ‘Redeem’ button and you’re done! You should log in to your Netmeds account and check under Netmeds SuperCash segment of your e-Wallet to know the value of your NMS SuperCash, which will be credited once your order placed using the NMS cashback coupon code has been delivered. Expiry of 100% NMS SuperCash Wallet Amount: The 100% cashback amount that has been credited to your Netmeds SuperCash wallet will expire 100 days from the date of credit. Any unused NMS SuperCash, pursuant to this offer, shall automatically lapse after 100 days from the credit date and shall stand forfeited. The NMS SuperCash wallet amount can be redeemed on fully Pre-paid orders only (not valid if partly paid by COD). Note: COD orders are not eligible for redemption of the cashback amount. The NMS SuperCash can be redeemed on the purchase of Prescription Medicines ONLY. The NMS SuperCash CANNOT be redeemed on OTC & FMCG products. The NMS SuperCash wallet amount can be redeemed for a maximum of 30% of total value of prescription medicines in your cart in one transaction. However, you can use the remaining wallet amount in subsequent transactions placed within the validity period of your NMS SuperCash wallet amount. Regular shipping charges will apply on ALL orders where 100% NMS Cashback wallet amount (full or part) has been used to make payment. Regular shipping charges are as follows: Delivery charges for ALL orders: Rs. 49; FREE Delivery on orders of Rs. 1000 or more. NO other coupon code/e-voucher discounts or promotional offers can be applied for the orders where the NMS SuperCash wallet amount is redeemed. NMS cashbacks will NOT be given for a pre-paid order where NMS SuperCash wallet amount is redeemed/used for making payment. The NMS SuperCash wallet amount is non-replaceable and non-transferrable under any circumstances. The NMS SuperCash wallet amount is not redeemable for cash. Netmeds.com reserves the right to cancel, change or substitute the 100% NMS Cashback offer at any time without prior notice and the same is at the sole discretion of the company. Netmeds.com reserves the right to change the maximum Cashback amount under this Offer at any point of time with or without prior notice to the customers. Netmeds.com reserves the right to withdraw NMS SuperCash from customers’ wallet account if any fraudulent activity is identified for the sake of availing the benefits under the offer. Netmeds.com is not responsible for any failed transactions as part of this offer NOR liable for any failures relating to technical, hardware, software, server, website, or other issues of any kind to the extent that these may prevent the Customer from participating in this offer. Netmeds’ decision shall be final and binding in all respects with respect to the matters relating to the offer. The offer shall be governed by and construed in all respects in accordance with the laws of India subject to the jurisdictional courts of Chennai.